This race for 2020 is already gearing up. 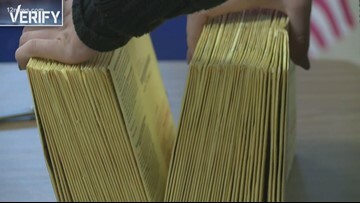 Do mail-in ballots take longer to count than casting your vote on election day? The early voting system does cause a delay in counting votes due to verification of signatures. We know it seems like this election has gone on forever, but it doesn't hold the record for longest election Arizona ever. This election did, however, turn out to be the year of the woman. Democrats won some major races in Arizona's most recent election. 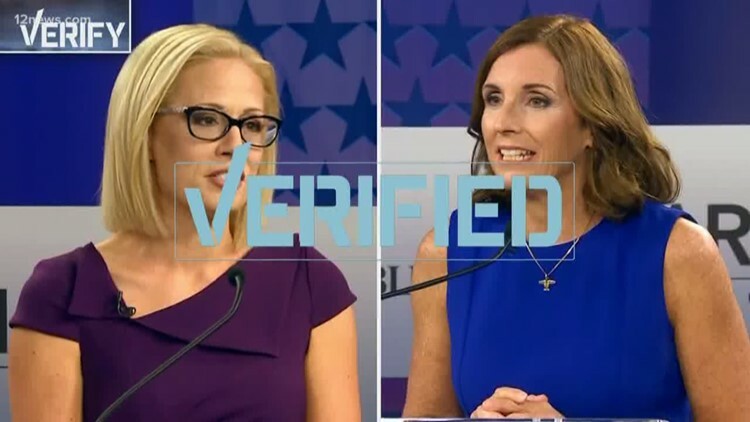 We verify if Maricopa County voters are splitting their votes to make Arizona purple. Doug Ducey believes the race for Secretary of State is over. He told 12 News that he called Democrat Katie Hobbs to congratulate her on her win. 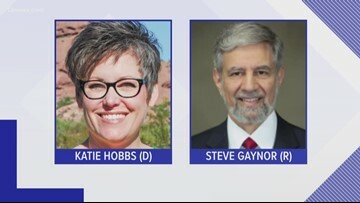 Katie Hobbs leads Steve Gaynor in the race for Secretary of State by 13,000 votes. 90,000 ballots are still left to be counted. 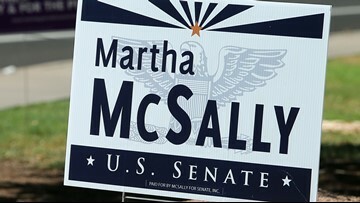 An Arizona law requires political signs to come down but not immediately after the election. 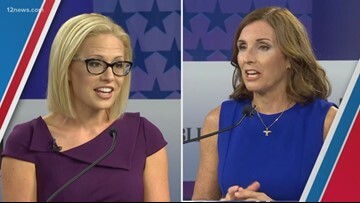 Martha McSally conceded in a video on Twitter, saying she has called Kyrsten Sinema to congratulate her. 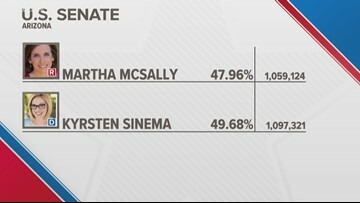 Democratic Rep. Kyrsten Sinema has won Arizona's open U.S. Senate seat, beating Republican Rep. Martha McSally. When would an automatic recount of votes trigger in Arizona? Under Arizona law, a recount is required when the difference between candidates is 200 votes or one-tenth of one percent, whichever is smaller. 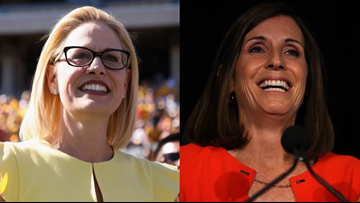 In the race to become the first woman elected to the U.S. Senate in Arizona Democrat Kyrsten Sinema has been declared the winner over Republican Martha McSally. Watch her accept her new position. 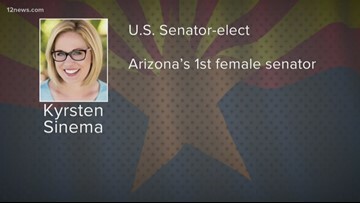 Arizona finally has it's first female Senator. 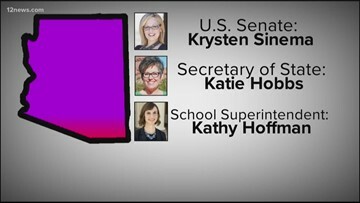 Democrat Kyrsten Sinema has been declared the winner by the Associated Press. Republican Martha McSally tweeted out her concession. 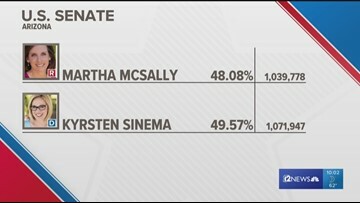 Kyrsten Sinema has increased her lead over Martha McSally by about 38,000 votes in the latest tally of ballots. Katie Hobbs has also increased her lead for Secretary of State. 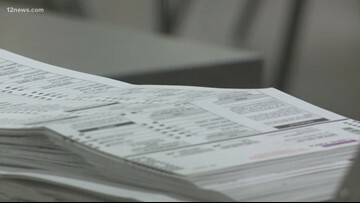 Maricopa County submitted an estimated 36,000 ballots on Sunday. Pinal County submitted ballots Sunday evening. Maricopa County still has around 266,000 ballots left to count. This lawsuit began as an attempt by the Arizona Republican Party to stop Maricopa County's practice of giving voters a second chance to correct early ballots. But a settlement today will allow all counties to do that.